When deeply understood and applied, these five simple concepts—what Richo calls the five A’s—form the basis of mature love and deep relating. They help us to move away from judgment, fear, and blame to a position of openness, compassion, and realism about life and relationships. By giving and receiving these five A’s, relationships become deeper and more charged with meaning, and they become a ground for the blossoming of human being. This book explores the tender and scary territories of our psyche and blazes a path through them… My accent in this book is necessarily on how we get stuck and how things go wrong. But you can also trust me to show ways to make things work better and ways the whole experience can make us better people and create a better world. Enlightenment can only be embodied in the world by people who love one another. So relationships are not about how two people can survive each other but about how the whole world becomes more capable of love. 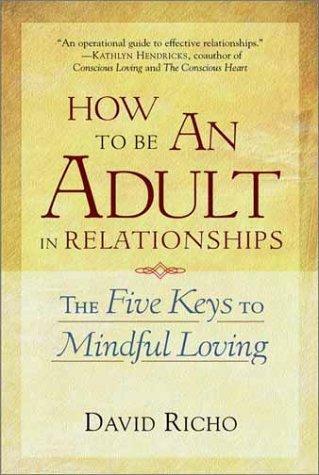 Some of the practical topics covered are looking for an appropriate partner; attracting and recognizing adult love; negotiating conflicts; how to maintain personal boundaries; overcoming fears of intimacy; how to show anger in mindful ways; surviving a breakup with your self-esteem intact; how to bring a spiritual consciousness to relationships—and useful exercises for putting it all into practice. Also by David Richo: Shadow Dance: Liberating the Power and Creativity of Your Dark Side. When deeply understood and applied, these five simple conceptswhat Richo calls the five A'sform the basis of mature love. They help us to move away from judgment, fear, and blame to a position of openness, compassion, and realism about life and relationships. By giving and receiving these five A's, relationships become deeper and more meaningful, and they become a ground for personal transformation.Richo offers a fresh perspective on love and relationships--one that focuses not on finding an ideal mate, but on becoming a more loving and realistic person. Drawing on the Buddhist concept of mindfulness, he explores five hallmarks of mindful loving and how they play a key role in relationships throughout life.